The Uxbridge MP, who sparked controversy when he said women who wear burkas look like "bank robbers", has frequently been tipped as a Tory party leader. 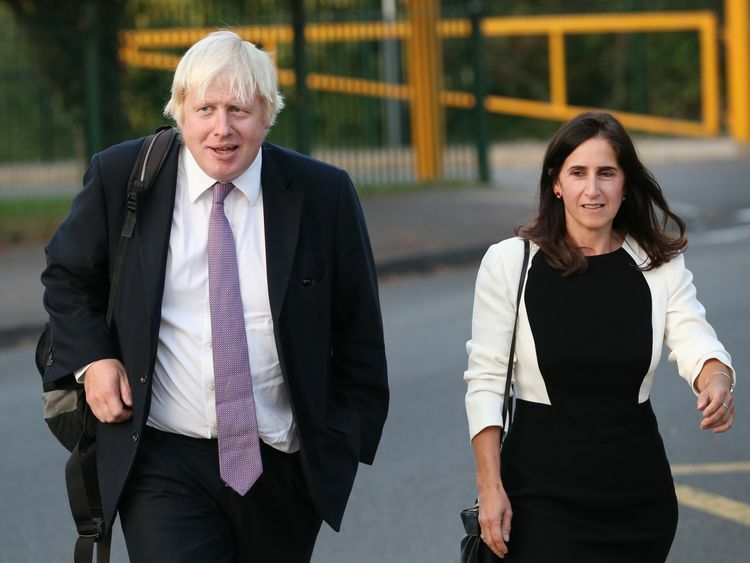 :: Boris Johnson and wife Marina Wheeler to divorce after separating 'some time ago'There have been suggestions that in leaving the cabinet, he was preparing to launch a leadership challenge against Theresa May.A Sky Data poll now reveals that if an unhappy home might put him off running to be the prime minister, he needn't worry.Of more than 1,300 people surveyed, 72% said the divorce was "not very" or "not at all" relevant to him being in the top job. Don't know 7%Mr Johnson and Ms Wheeler, a lawyer, have four children - Lara, 25, Milo Arthur, 23, Cassia Peaches, 21, and Theodore Apollo, 19.The former foreign secretary was fired from the frontbench in 2004, when the mother of an alleged mistress went public with claims of an affair. Tory leader Michael Howard said it was a "personal morality" issue.Nigel Evans, a fellow Tory MP, said news of Mr Johnson's divorce was a "personal tragedy" and wished them both well.He added: "We are in 2018, we're not in the 1950s now - things move on. "People make judgements about people, they're able to distinguish between their personal lives and their public lives. "In 2011, the then Labour leader Ed Miliband married his long-term partner Justine Thornton, after becoming the first leader of a major political party to live outside wedlock.In the late 1950s, then prime minister Harold MacMillan's wife Dorothy had an affair with Conservative MP Bob Boothby, but the pair never divorced because of the impact it would have had on his career. Sky Data interviewed a nationally representative sample of 1,307 Sky customers via SMS on 7 September 2018. Data are weighted to the profile of the population. Sky Data is a member of the British Polling Council and abides by its rules.For full Sky Data tables, please click here.